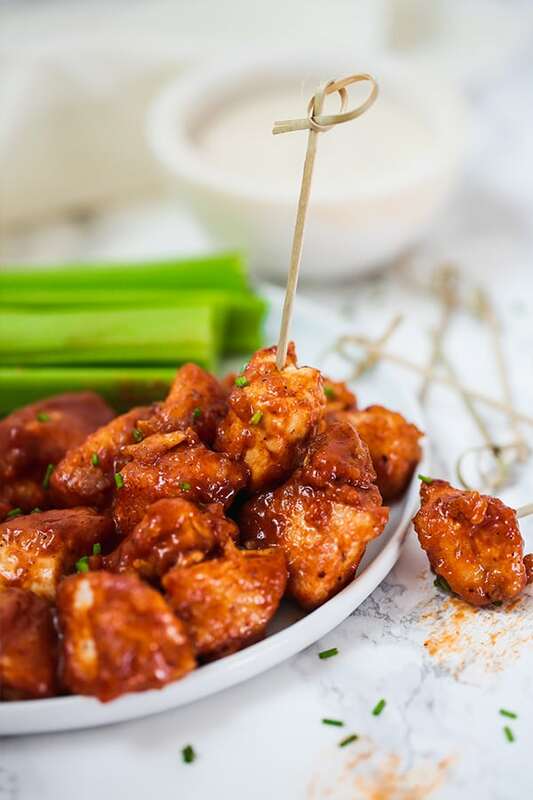 These BBQ Chicken Poppers are the perfect summertime meal! Serve them as an easy dinner, or bring it to a fourth of July cookout as an appetizer. They’re paleo, Whole30, and AIP compliant. There’s nothing quite like BBQ chicken in the summertime. Heck, any time of year really, but especially the summer! I was always wary of BBQ growing up… maybe because I intuitively knew that traditional BBQ just didn’t jive with my body, or because I was resisting becoming a Texan after growing up in New York, but those days are long gone! BBQ chicken is life. My only issue with BBQ chicken is that it tends to take a while in my house. My husband always like to slow cook it in the oven which takes up our oven space for longer than I’d like. So, how do make it easier and faster? 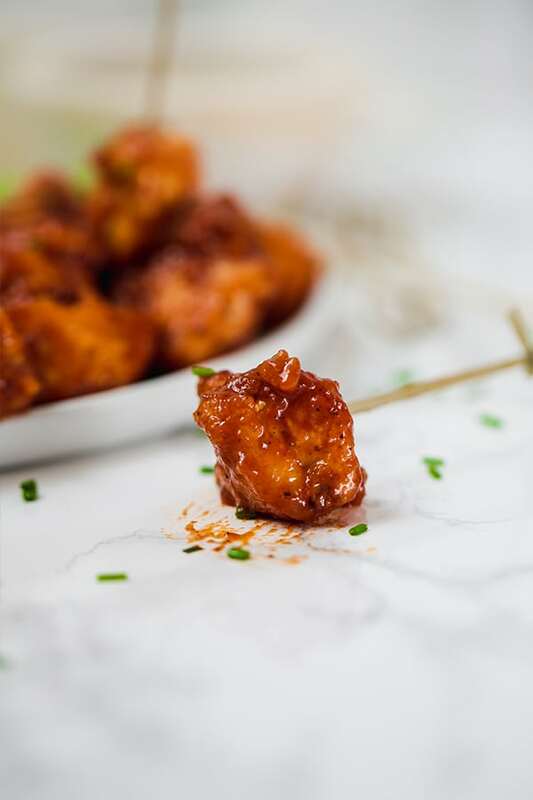 These BBQ Chicken Poppers are just the thing! 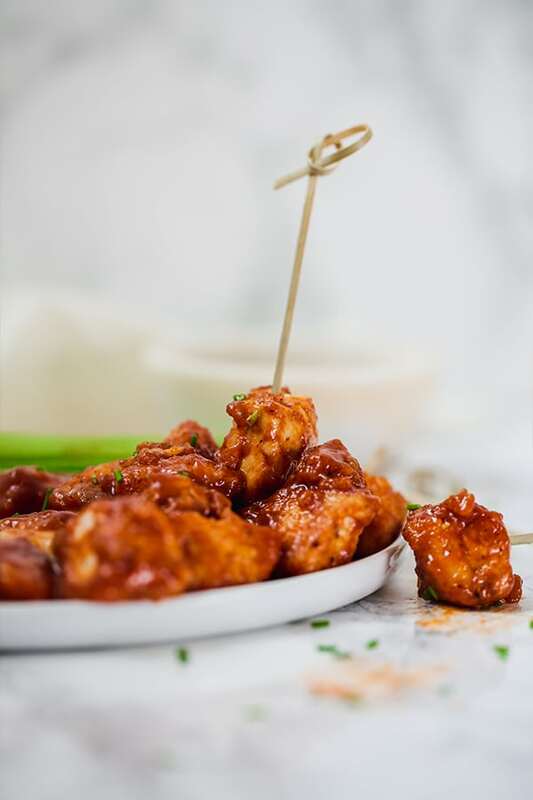 These BBQ chicken poppers are so simple to make, and are easily made Paleo, AIP, and Whole30 compliant. The base of the recipe is just a few simple ingredients, and you’re free to use whatever BBQ sauce that you’d like to jazz it up. No nightshades or sugar required if you don’t want them! These poppers are crispy, flavorful, and my husband who is ultra picky when it comes to BBQ chicken loved them! Make them for a simple weeknight dish and serve them with sweet potato fries, tater tots, or this bacon ranch sweet potato salad. The whole family will enjoy! Pack them for lunch to eat at work and make your coworkers jealous. Serve them as an appetizer for fourth of July, Father’s Day, or any cookout! Lay them out on a serving plater next to some celery and carrots with toothpicks for your guests to enjoy. You can also use chicken thighs for this recipe. Coconut oil coats the chicken to help the arrowroot starch stick so you don’t need to use any eggs! It also helps keep it moist and delicious. Technically, you should be able to use avocado oil as well, though I haven’t tried it and can’t guarantee it will be the same. This is what helps make the chicken crispy. I would not sub cornstarch or tapioca starch here as it would make the chicken too gummy. You can easily find arrowroot in the flour section at most grocery stores, or online. 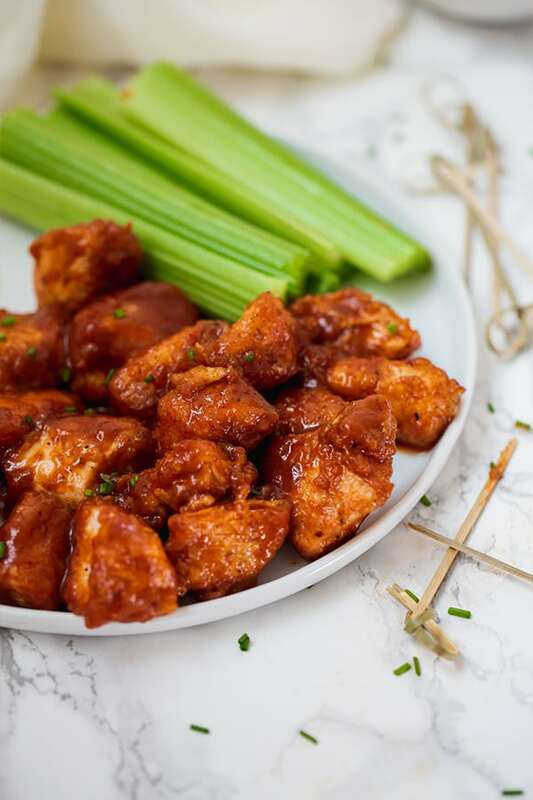 Set up a station with the cubed chicken in one bowl, 1/3 cup of coconut oil in another bowl, the arrowroot starch combined with the salt and pepper in another bowl, and a plate. Start to dip the cubed chicken in coconut oil, then coat in the arrowroot starch mixture, and set on a plate. Repeat the process until all of the chicken is coated. Using a large, deep skillet, melt 2 tbsp of coconut oil over medium heat. Use tongs to place the chicken in the skillet. Turn the chicken cubes until evenly crisped and internal temperature reaches 165 F. Add more coconut oil if needed. Place the chicken into a sterile bowl and lightly pat dry. Allow cooling for 4-5 minutes until mixing with a BBQ sauce of your choice and topping with fresh chives. Mix until well combined. 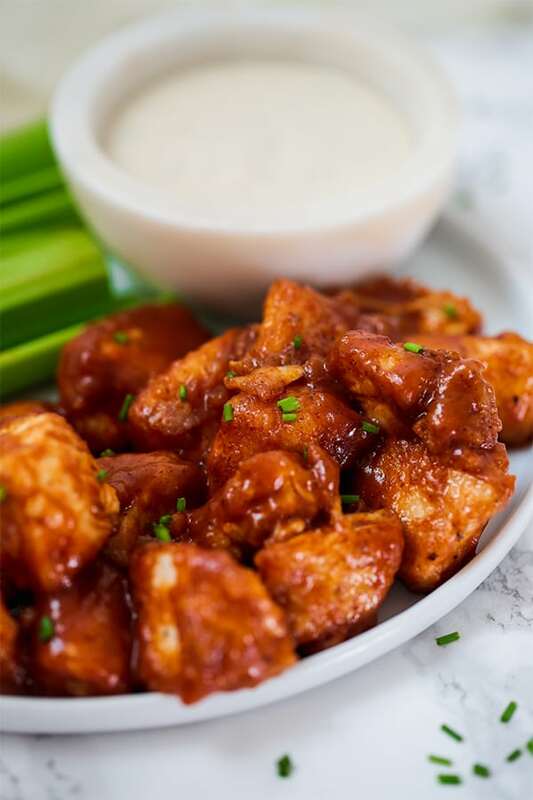 Serve with more BBQ sauce or a compliant ranch dressing. I used avocado oil and coconut/flour flour mixture … all stuck just great… love this! Made my own w30 approved bbq sauce and wow!